I’ve called this Part One as I’m going to Belle Vue for one of the last games there; to watch Brighton on 25th November. I’ll take some pictures of the ground for Part 2 and also mention the rise of the Rovers from their near-death experience, which was happening the last time I went. They’re moving to their new stadium very soon; in fact, I think the game with us on 25th is their 3rd last at the Belle Vue. A picture of their new place can be seen here. 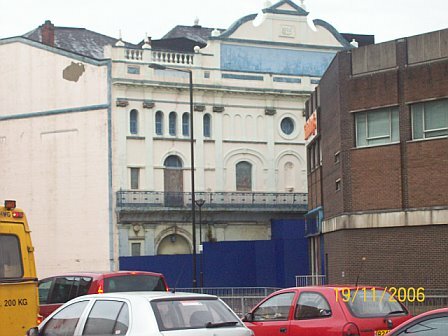 Existing pictures of Belle Vue taken by other people can be seen here. When I hear or see the words Doncaster Rovers I remember staring aghast at the BBC Vidi-printer in the mid-eighties watching the score Doncaster 7 Reading 5 coming through. It’s still to this day the most goals in a league game in recent years. Something else about them is that they were involved in the longest game ever with Stockport County at Edgeley Park on March 30th 1946. I found details on Wikipedia. After 30 minutes of extra time it carried on for a further 203 minutes. This line amuses me: Stories abound of fans leaving the game, going home for their tea, and coming back to watch the end of the game! We faced Doncaster at a time when both clubs were in the midst of appalling crises. The fixture today was like the meeting of a couple of down-and-outs over a bottle of cheap whisky in an alleyway. Both had reached rock bottom and had started to dig, bitter at their respective ill treatment and abuse at the hands of their masters. 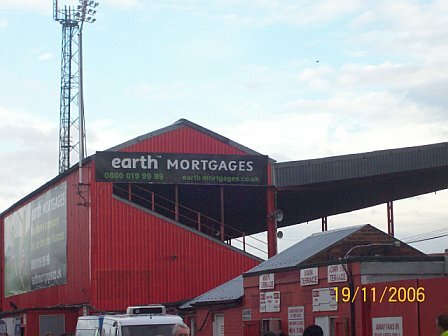 Our ‘master’, chairman Bill Archer, had sold the Goldstone Ground from under us (not bad for an initial investment of £57) to make a profit and thus making us homeless, facing the embarrassment and shame of sharing the ground of a team in Kent, awkward to get to by either car or public transport; either option taking a good 2 hours. Doncaster still had a home, at least, but their ‘master’, chairman Ken Richardson, was busy trying to burn it down, having, just the previous week been implicated in the recent fire which destroyed a large section of their main stand. It was a sad, sad time for both clubs; proud clubs with a long history. Almost inevitably we occupied the bottom two positions of the whole league, looking up at the rest from a stinking quagmire of bad football and corruption. Ironically, a few months previously, our last ever match at the Goldstone was a 1-0 win over Doncaster which lifted us off the bottom of the table for the first time in months; giving us the initiative going into our last day showdown with the then bottom club Hereford, where we just avoided the drop to the conference by the skin of our teeth (thanks to a 63rd minute equaliser at Edgar Street by Robbie Reinelt; commemorative shirts with Reinelt 63 have been available since! )We were now settling rather uncomfortably into another 91st place position, cushioned from non-league this time only due to the even worse plight of the club we were playing today, Doncaster. It was the nadir for our club. Almost certainly theirs too. It was difficult to believe it was happening to our us; the Albion, who when I started supporting them as a child were in the top flight, in an FA Cup final and boasting 2 England Internationals in Peter Ward and Steve Foster, playing to 20,000 odd fans (sometimes 30,000) in the wonderful stadium that was The Goldstone. So this fixture was about the least attractive of the league program that Saturday, but the day was remarkably memorable nonetheless, mostly for the wrong reasons, but partly because of the fans, often overlooked by the bosses but still the only constant for any football club and the most important. The Doncaster fans were brilliant, so were we. It was a good day for fans but not much else. As mentioned it came just a week or two since the controversy over the fire at the stand at Belle Vue. Ken Richardson was implicated in the arson attempt, thought to be a desperate ploy at solving his financial difficulties, and later charged with conspiracy to burn down the ground. Needless to say the Doncaster fans were not a happy lot. Their crowds had diminished to record lows on account of fans being loathe to put any money into their chairman’s hands. The few that did turn up though protested vociferously before, after and during the match. We joined in heartily, quickly picking up anti-Richardson songs. We knew how they felt. It turned in to a bit of a fans united day, albeit an ad hoc one and attended only by the real die hards. The weirdest thing about the actual football match, though, was undoubtedly Doncaster’s keeper. After half-time all of us in the away section (‘all’ being no more than about 300 – times were really bad) stared in bewilderment at the keeper waddling towards the goal we stood behind. He’d played in the first half too but as he was at the far end we hadn’t really noticed him. Now we knew why the Albion players had kept taking pot shots at him in the first half. He looked like a Sunday League player. In fact, he didn’t look that good. The highest praise you could bestow upon him, if pressed, would be that he was a shot-stopper. Half the shots fired at him literally bounced off his belly before he could get his hands to it – he was comically rubbish. It just added the element of farce to a game that was desperately attempting to be taken seriously, but failing. It later transpired that ‘Fatty’ Smith was none other than the Doncaster Manager Mark Weaver’s next-door-neighbour. Mark had heard he played in some league or other and, on a whim, dropped the first choice keeper in favour of ‘Fatty’. ‘Fatty’ obviously didn’t specify that the league he played in was an under 11s lads-n-dads league. He was so unnerved by the whole experience that he never returned to Belle Vue. We won 3-1 in the end, something of an achievement, as away wins at this time were about as frequent as sightings of the beast of Bodmin. From Doncaster’s perspective, letting in 3 goals at home to us did constitute a pretty dire performance, dodgy keeper or not. To lose to us meant you were very bad indeed! Their goal, however, was a moment of magic in an otherwise forgettable performance – a volley from outside the area in to the top corner, via a minor deflection off our keeper. The ground wasn’t what I was expecting. I envisaged one of the big old South Yorkshire grounds, like Bramall Lane, Oakwell or Leeds Road. I had this idea of it having great swathes of terracing covered in those shed-like wooden stands with the v shaped corrugated roofs. Whether it ever was something matching that description I’m not sure. Their biggest crowd was 37,149 v Hull City in Division 3 North on 2 October 1948. That’s quite big, so I suspect there was a bit more of Belle Vue in those days, as even in the days of packing them in there’s no way you could get anything like that number in here. They had a fairly large main stand that sat in the middle of one side, suitably adorned with ‘Richardson Out’ flags. 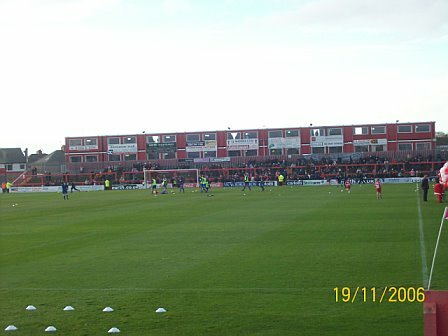 The away section, behind the goal to the right of the main stand, was a bit of terracing. I say ‘bit’ as, rather peculiarly, it didn’t span the whole width behind the goal, instead just providing a little pocket in the top corner nearest the main stand. The other end was a small home open terrace, and down the other side was a slim and rather industrial looking covered terrace. It seemed like a fairly typical old fashioned lower division ground but I was expecting bigger. I can’t wait to go back with fresh eyes in a week, almost 9 years to the day, to see a big crowd and a set of happy supporters. It will be in such welcome stark contrast to my first visit. Now that brings back an awful lot of memories that does….. Frightening times. Bad times. Times of downright hard work too. But eventually they ended. And now we’re going to meet again next Saturday – with smiles, a big welcome for all and optimism in all our hearts. I hope I see you there David. And Liz, and Sarah, and Roy, and Simon and all those other wonderful Brighton people I met during those painful times. Enjoy Belle Vue. She won’t be there much longer at all. The Rovers will be gone by the New Year. And she will be gone soon after. You’ll see the new ground as you leave the motorway. Nice it looks too. 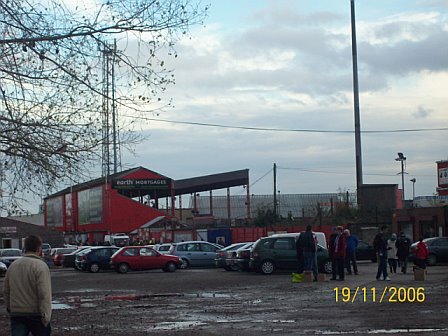 But BV, despite it being a pimple on the arse of Donny, will always be the home of memories for me. It’s just over nine years since I last came here for the 92 vs 91 clash, in the season Doncaster fell out of the league to 3 figure crowds, and thus saving us from the same fate by providing a cushion. It was nice to come back with the Donnie fully recuperated from their near-death experience and thriving in League One; and with us having had an eventful 3 promotions and 2 relegations. This was also their fourth to last game at Belle Vue before they start afresh at the Keepmoat Stadium early in the new year. It makes me sad when these traditional stadia are pulled down in favour of soulless new builds. The Keepmoat looks particularly bland from the pics I saw in the program, but that’s the way it’s going for most clubs now, alas. The Belle Vue has been home to Rovers for 84 years and it looks like it, too. You can’t just replace the atmosphere of 84 years of football, soaked into the wooden beams, concrete terraces and the seats. I had arranged to meet my dad at the station. He rang me up from Biggleswade, where his train was stuck, to tell me he’d be 2 hours late, so to meet him in the ground. So I’d have to have a pre-match pint in the CAMRA recommended Corner Pin myself. I couldn’t remember much about Donnie from my first time there, except a disgusting bacon butty I had in a greasy spoon café. Apparently they like their bacon very fatty and lightly done in this part of the world. It makes me wince to recall pulling great rubber band-like white rinds of fat from my mouth like a reluctant magician. To the left a glass building invites you inside claiming that all destinations in Doncaster can only be got to by going through it and its shopping centre – yeah, right! I wasn’t falling for that one. I tried crossing the road to the town centre. It really didn’t want to be crossed. I did it 4 times during the day, but wherever you are and wherever you want to get to seemed to involve a superfluous 400 yard walk to get to the designated crossings. I needed a pole vault. Ironically this real ale pub was on the same side as the station, as I eventually realised, after two scary jay crossings where I felt like ‘Frogger’ in the eighties computer game. It was a lovely pub and the two local real ales I had were delicious. It prepared me nicely for the fairly awful 2 mile trek to the ground along another very noisy dual carriageway with roundabouts. A couple of chip shops en route are most welcome and needed; the lunchtime special I had of small fish, chips and sausage more than made up for my bacon horror before. 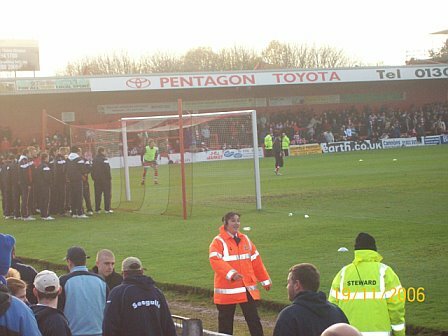 The ground was as I remembered it, except I didn’t remember there being executive boxes behind one of the goals before, opposite the away terrace. They were highly amusing, a double decker of portacabins leaning ever so slightly. They looked like the temporary office of a foreman on a building site. In each were huddles of people standing up. I wouldn’t be surprised if you had to climb a ladder to get to the upper tier and claim your free Bovril. The actual game was awful from my perspective. It was only after 15 minutes that I realised their number 9 was Mark McCammon, one of the worst players ever to wear an albion top. I don’t know what Donnie had done to him but he was a transformed man. He actually ran quite fast at one bit. Needless to say he scored shortly after I spotted who he was, the only goal of the game. We couldn’t compete with them physically. I thought we were the better side but our rather diminutive team couldn’t cope with 11 six-foot-fivers built like brick shithouses. Jake Robinson, our man of the moment tried his best, consistently rounding players, beating two and three at a time… but there was always another one to bump into. Every breakthrough we made there was a foot in the way or a gentle shove sending our dainty forwards flying. Their tight man-to-man marking, along with a fairly high level of dirt, made it virtually impossible for us and it was the most frustrating game I’ve seen in years. I don’t like big hard sides. It may be a recipe for success in the lower divisions but I think it just spoils matches. I was looking forward to the silky football Deano had got us playing of late and the great Cox /Robinson link up at front but it was never going to happen today. £15, however, was very cheap (relatively) for this division, so hats off to the Rovers for that. 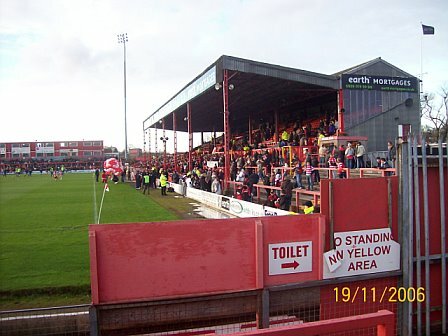 RIP Belle Vue – enjoy the last few games there. For a neutral’s perspective of the day read this review from Shaun Smith, from his site – 101 Football Grounds Club. Also visited the ‘Corner Pin’ on the way back from Sheffield a couple of weeks back. A good pub indeed and very convenient for the railway station. The selection of ales was very good and just what we needed after watching Spurs suffer at Sheffield Utd. Thanks for your comment. Yes, the Corner Pin is a lovely real ale house. I had a look at your site – it’s excellent! Really well put together and building up quite a collection of grounds there. Certainly one of the best I’ve seen. I’m sure you won’t mind if I add your site to my list on the front page, would you? No problem and I will return the link.